One recent sunny afternoon, I took a bunch of exercise balls with little sticks taped to them to the local grammar school where I met a class of second graders. 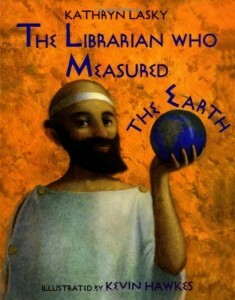 As part of my war on the flat earth myth, I had encouraged their teacher to read Kathryn Lasky’s The Librarian Who Measured the Earth to them, and I had already come to class once to explain Eratosthenes’ method for measuring the earth’s circumference. A picture book celebrating Eratosthenes. Not perfect but pretty darned good. They seemed to get it, mostly. But I was left wishing for a more concrete, experiential way of showing them what Eratosthenes did. So I devised this hands-on exercise that they could do in groups of three. 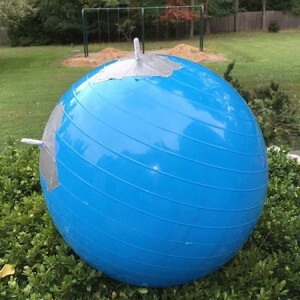 A prototype model “earth” with gnomon. The final versions were slightly larger. I used inflatable an exercise ball as our model “earth.” I taped pipe cleaners to them at two points on a line of latitude (a fabrication seam) as gnomons. I gave each group a tape measure. I explained that they were going to rotate their “earths” until one of the gnomon cast no shadow. Then, holding the ball still, they needed to measure the shadow cast by the other gnomon. They also needed to measure the height of this gnomon. Finally, they needed to measure the distance between the gnomons. I handed out a worksheet I had prepared so all they needed to do was fill in the first three columns on the table. I had them carry out the steps three times (one for each student). When they finished, they were to bring their sheets to me so I could calculate the circumference of their “earth.” Pretty basic instructions that even second graders can follow. 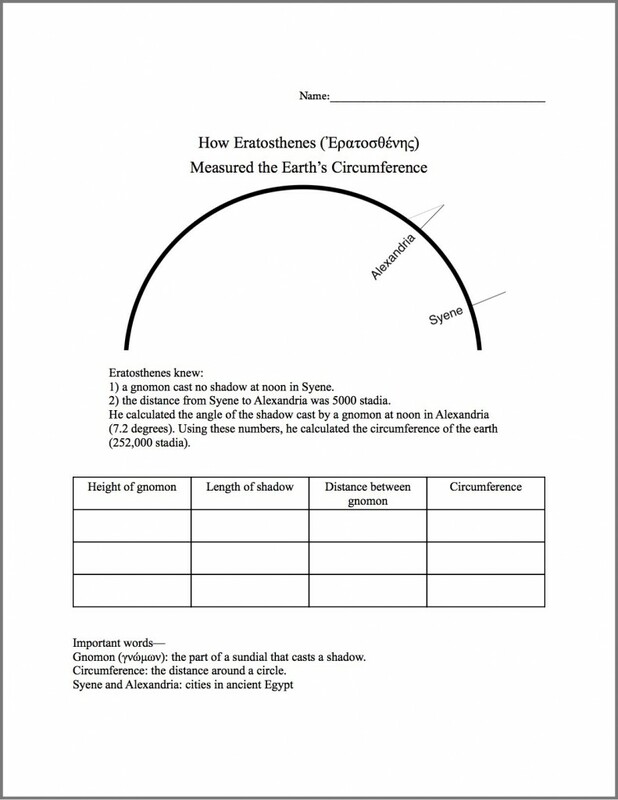 Worksheet for students to measure the circumference of their model earth. They then came to me with their data. I plugged their numbers into a simple spreadsheet I had made (I confess, I cheated in so far as I used trigonometry to calculate the angle of the shadow cast by the gnomon). Their numbers were reasonably accurate (especially given the size of the ball and the uncertainty in the measurements). Thirty minutes later, I had 33 second graders who not only knew that Eratosthenes had calculated the circumference of the earth, but could give a coherent account of how he did it. They eagerly took home their completed worksheets. Judging by the number of parents who have said something about it, they were able to explain to their parents what they had done and how. For me, this is an important form of outreach, a way of “taking history of science to ‘them’.” Do I get any professional credit for it? Nope. Does it make the world a better place? Yep. If you’re interested in more details, contact me. I’m happy to share. Next up: I’m trying to convince the school to let me and the students use the flagpole as the gnomon for a permanent sundial.